He has designed an international education program that provides everyone regardless of nationality, age or gender with the opportunity to learn simple techniques for developing the capacity of their mind and eventually attaining the permanent inner peace of enlightenment. To date, this program has been implemented in over forty countries. Geshe Kelsang’s compassionate intention is embodied in the International Temples Project (ITP), a unique international fund dedicated to public benefit. The ITP fosters the international development of a wide range of contemporary Buddhist institutions. These presently include Temples for World Peace, Kadampa Meditation Centres (KMCs), International Retreat Centres (IRCs), Kadampa Buddhist Centres (KBCs), Hotel Kadampas, World Peace Cafés, the International Schools Project, and Tharpa Publications. All these institutions provide a public service that exemplifies the Buddhist faith. 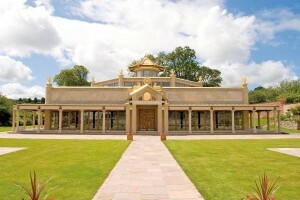 Kadampa Meditation Center Florida (KMC FL) is the main temple and spiritual home for the Florida centers. The temple hosts many special events throughout the year, such as the Florida Dharma Celebration every December. They welcome many visitors everyday who come for classes or simply want to stop in and see the beautiful shrine. Parbawatiya KBC community regularly attends and helps at the temple’s events.